I was in Chicago a couple of months ago where I taught several sessions during an Ethnic Media Workshop held by the Investigative Reporters and Editors organization. Mark Horvit, IRE executive director, asked me to talk about multi-tasking and juggling daily work while working on in-depth and watchdog stories. During my years as a beat reporter, I was raising two children, now grown (thank God), and I was a military wife. My husband was gone most of the time. And as I juggled work, the kids soccer games, karate and ballet lessons, I slowly became a master at planning. And with time I realized that planning is a discipline. Embracing this concept made my life easier as I approached complex stories, covered the daily stuff, and handled my personal life. There are things you can’t control in life like the weather or breaking news. But planning your week ahead of time gives you flexibility and control. It could be a small task such as making a couple of calls, reviewing a sample of data or making an open records request. During the past 15 months, I had to be extremely disciplined to accomplish many objectives while working on freelance stories, writing blog posts and working behind the scenes for EdMoney.org, traveling around the country training journalists and being part of efforts to build a startup from scratch. Other duties included planning IRE annual conference (oh yes, I’m on the conference committee) and judging this year’s IRE contest, a labor-intensive job. But wait I’m not done. I also managed to be attend a criminal investigators training-internship program where I’ve been investigating cases for public defense attorneys. The day has 24 hours. That’s a fact. So that means that there are so many things you can do in 24 hours let alone eight if you plan accordingly. I know…I know…you need to sleep. In essence, the secret to multi-tasking is simple and lies on three important words: planning, organization and discipline. You must have the discipline to be organized and plan your days. You must be organized because you can’t plan and follow up if you are not. And you must be disciplined because without discipline to focus, you can’t do any of these things. So how do you become a disciplined person? You do that by following a task and coming back to finish if something happens and you don’t have the time to finish that specific task. Successful athletes are disciplined by nature. They trained every day to reach their goals. So do musicians –I’m one since I was 9 years old—and they practice for hours and hours to perfect their techniques and become better. Our military forces are disciplined too and those who do well are the ones who succeed in the military world. You can be disciplined as well. You need to focus and follow what you started. Is not impossible. If it doesn’t work today, tomorrow is another day. Write a list before every week ends. Plan phone interviews and make appointments the week before. I usually write a list by the end of each day. I mark my appointments on my blackberry calendar to receive alerts. My goal? To complete each of those tasks before the day ends. I take pleasure completing one after the other. Sometimes I don’t reach my ultimate goal and that’s okay. Don’t be a procrastinator. 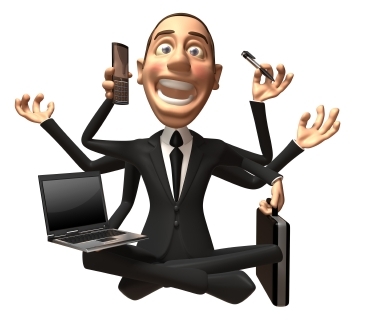 Become a master at multi-tasking. You’ll be surprised at what you can accomplish when you set goals and focus.